Grant Anderson’s timing couldn’t have been better. The Albury NSW second generation racer finally clinched his career first Valvoline Raceway main event success last night in the Brian Healey Gold Cup and in the process dedicated the milestone to a close family friend whose father had passed away suddenly the morning before. Anderson sped the #37 WASP/Bandag Latrobe Valley entry from the tenth row of the grid to run down and pass entire racer leader Daniel Sayre in dense lapped traffic. Teenager Sayre was gracious in defeat, still managing an optimistic smile and thanking sponsors and family for their support after nearly pulling off the win of his short career. Robbie Farr trailed the lead duo home in third place. Former USC Champion Jamie Veal looked destined for a podium finish as a minimum but contact he between he and Shaun Dobson in turn three saw the #35 SWI Maxim spin to a stop and have to begin from the rear of the field at the restart. Veal stomped back to an eventual seventh place in the laps that followed. Queenslander Mitchell Gee rewarded his Titan Racing team with a strong top ten performance on season debut whilst West Aussie USC rookie Callum Williamson also got off to a positive start qualifying straight into his first VR main event. Albion Park Rail USC racer Steve Caunt had a bruising wreck in the B-Main where he all but totalled his ex Kasey Kahne entry and was briefly knocked unconscious in the rollover in turns one and two. The Speedcar main event saw a small field but ferocious competition and Bungendore young gun Michael Stewart emerging with the victory in his new look black #51 Kelley’s Body Works CP3 chassis. Stewart accounted for veteran Darren Jenkins home in second place and lively youngster Reid Mackay relishing his new Hawk motor to finish third and show that he’s clearly stepped up his game. “The track was beautiful,” smiled the second generation victor, “the car felt really nice throughout the entire race and I knew we had a good chance of getting the win if I could keep hitting my marks. 17 year old Kaidon Brown recovered from a second heat rollover on the start on the main straight to return in the main event and finish fourth. The A-Main was marred by a violent flip for Michael Jordan in an earlier heat when the right front wheel appeared to sheer off as he entered turn one. The Dominator Engines #6 flipped many times coming to a rest against the turn two fence where Jordan fortunately emerged unscathed much to the relief of the big crowd on hand. Liam Heaton celebrated his first Valvoline Raceway main event win in the #89 Legend Car to lead home Nathan Camilleri in second place and Dan Morris in third. Typically hectic and competitive racing was again a hallmark of the Legends class and the traditional battles between the youngsters in the category is off to a good start already on Night One. The next event at Valvoline Raceway is this Saturday, October 7, with Late Model sedans, Wingless Sprints, Street Stocks and AMCA Nationals. 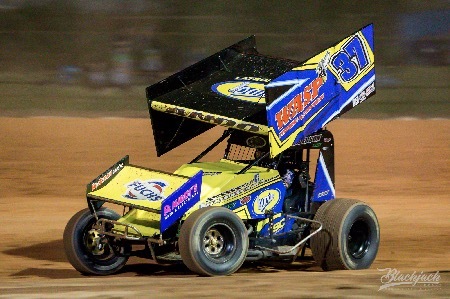 USC Sprintcar action turns to Murray Machining & Sheds Speedway Murray Bridge in South Australia for the Bill Wigzell Battle of the Bridge and first round of USC SA.